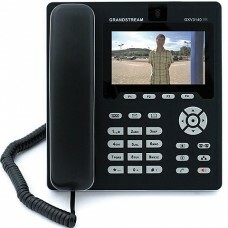 The Grandstream GXV3140 is a potential remote video station for the T24S door station. The powerful IP video phone features high quality images delivered on a large 4.3” digital TFT color LCD (480x272 resolution). The phone has a comprehensive set of important features such as transfer, hold and conference calling for use in a professional environment, full duplex speaker phone with an acoustic echo canceler for noise suppression. Integrated 1.3 Mpixel camera (can be switched on and off). Intuitive menu, for configuration and operation of the phone and the T24S door station. H.264 baseline (with CABAC enhancement pending) and H.263/H.263+ video standard. Dual switched 10M/100M auto-sensing Ethernet ports, USB port (for example, for external keyboards), SD card slot (you can easily transfer and use your data with the phone). The integrated connector lets you attach a headset and the video image, which can be displayed on an external monitor using the A/V jack. Additional multimedia features: multimedia player for data from a USB stick or SD card, display of RSS feeds, access to Internet radio.